The court ruling in the Netherlands this week will have showed PPG that it was not only facing a hostile company but also a hostile country. At that point you run the risk of wasting a lot of time, money and focus on a path that has low odds of success. The decision to walk away, while likely very disappointing for the company is probably the right move for PPG. The decision to push PPG away by Akzo may end up as one of those classic case studies of corporate hubris getting in the way of something that the company will ultimately regret. In our view, PPG has options, as there has been no real change in overall strategy. Growth through a combination of organic moves and bolt-on acquisitions with surplus free cash being returned to shareholders. Akzo might have been a big acquisition, but it was not an off-piste move and we see no need for PPG to change its overall course – the acquisitions will no-doubt be smaller and the share buyback bigger. In the slower growth world that we are all acknowledging, PPG will likely have slower top and bottom line growth than it would like, but its shareholder returns should remain high. The company has been well managed for decades and we do not expect that to change. For Akzo there are more challenges and the stock price prior to the proposal reflected years of disappointment in a management team that has overpromised and under-delivered consistently – see prior research. The plan outlined to investors in defense of the PPG bid was met with a lukewarm reception at best, and now the company has to execute against that plan and surprise to the upside to provide a better alternative to shareholders than the PPG option. The separation of the chemical business appears to be a serious intent by the company, but we do not expect the business to generate the returns to Akzo shareholders that were implied, in part because of a low tax base – pushing the company towards a spin rather than a sale, in a market that is looking for consolidation to drive synergies rather than yet another mid-cap, slow growth, partly commoditizing chemical company. 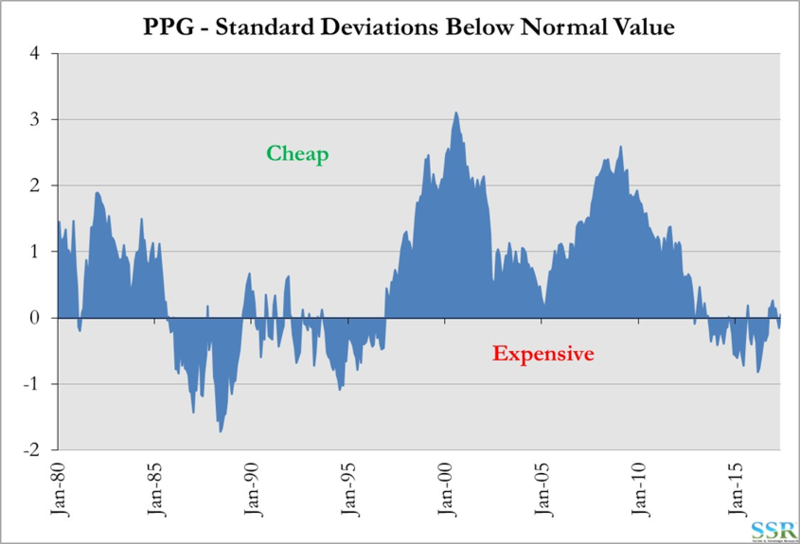 PPG is not an expensive stock (first exhibit) on our normalized framework, and simply focusing on production and distribution efficiencies in its major markets to try to mimic some of the SHW margins could drive EPS growth well above expected levels. In addition, if plan B is smaller acquisitions and more free cash for the shareholders, PPG could also probably win shareholder support by raising its dividend meaningfully as the yield is quite low. PPG is one of the cheaper diversified stocks in the chemicals universe today – second chart. We would certainly be interested in the story from here given valuation and would see any weakness stemming from today’s announcement as an entry point. We would not own Akzo and are taking the company off our preferred list. The go-it alone strategy will get harder if PPG starts buying other smaller assets in Europe and if SHW starts building up its presence in Europe once the Valspar deal is complete.